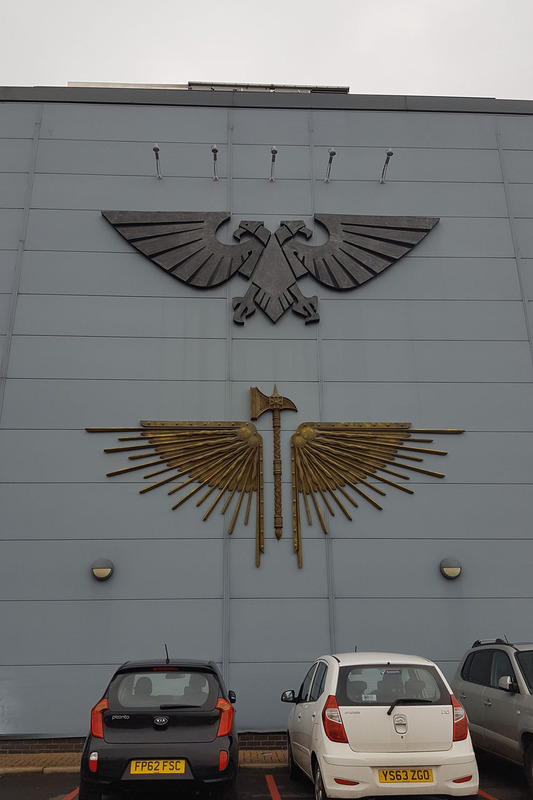 As our "Operation Sealion 2018" was not only build up on visiting Salute on Saturday, we did a tour to the lead belt of Nottingham, and I was eager to see the renovated Warhammer World, the head quarter of Games Workshop. 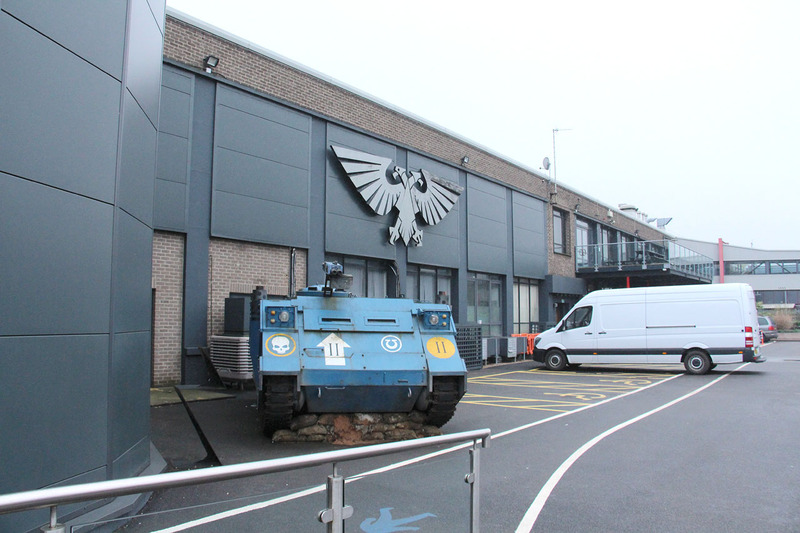 The entrance has been redone and the venue is now barrier free. 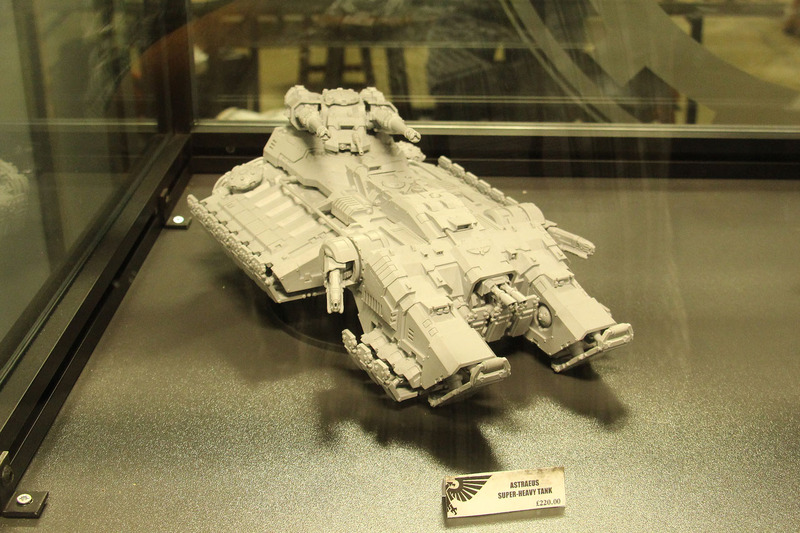 The Rhino is still in the front, and yes it is functional, there are videos of it driving around on facebook. 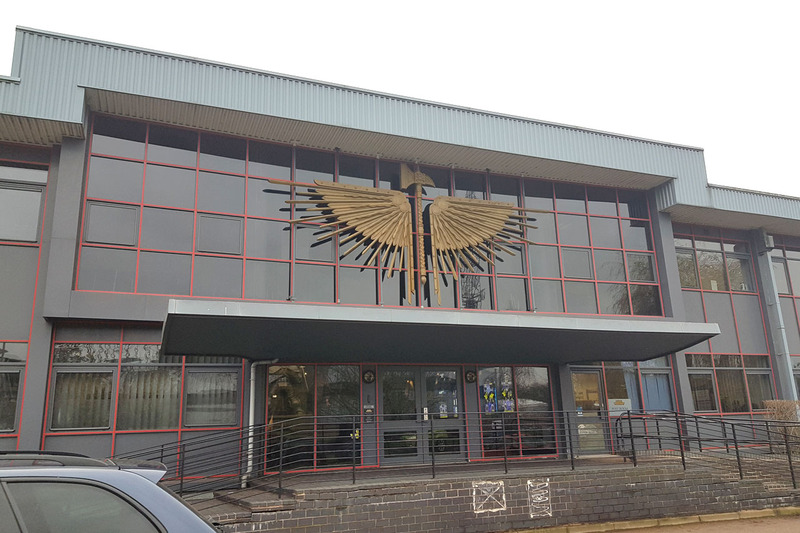 The main office got its front re-designed. 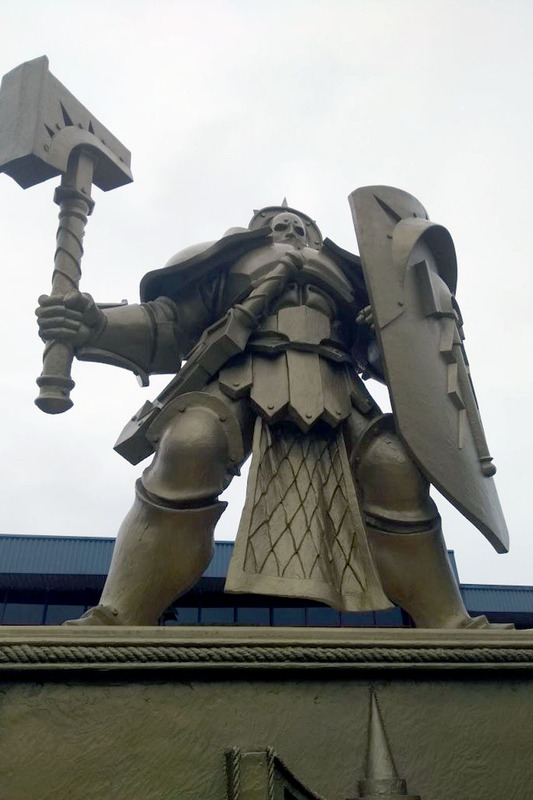 The Imperial Eagle was replaced by Sigmars Hammer during the release of Age of Sigmar. 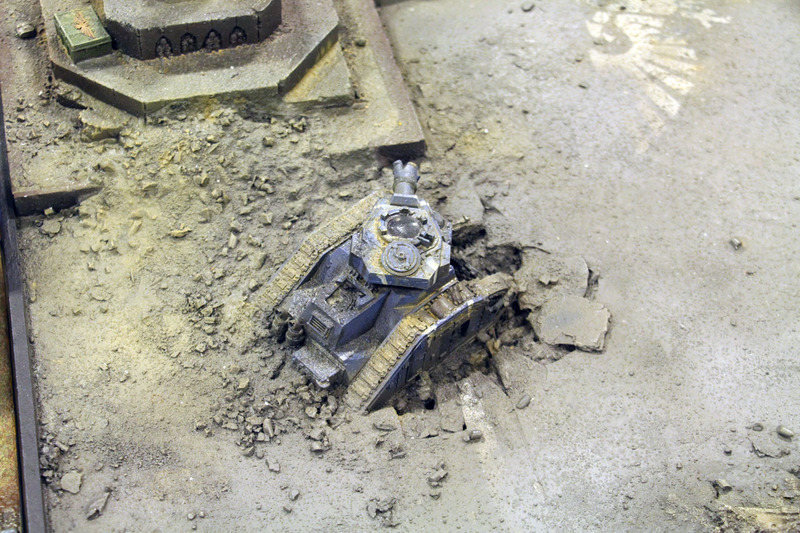 There are a couple of pictures from the old front in my 2004 coverage of Warhammer World. 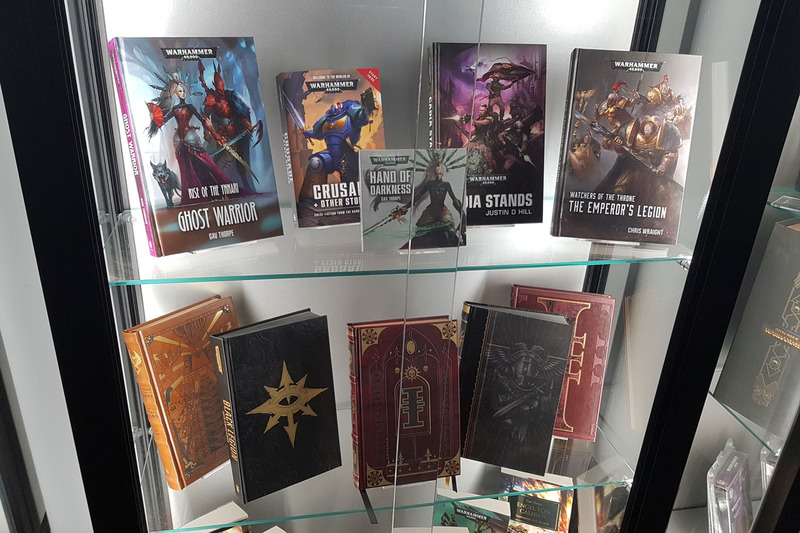 They even took down the Space Marine, guarding the office front and replaced it with the statue of a Stormcast Eternal. 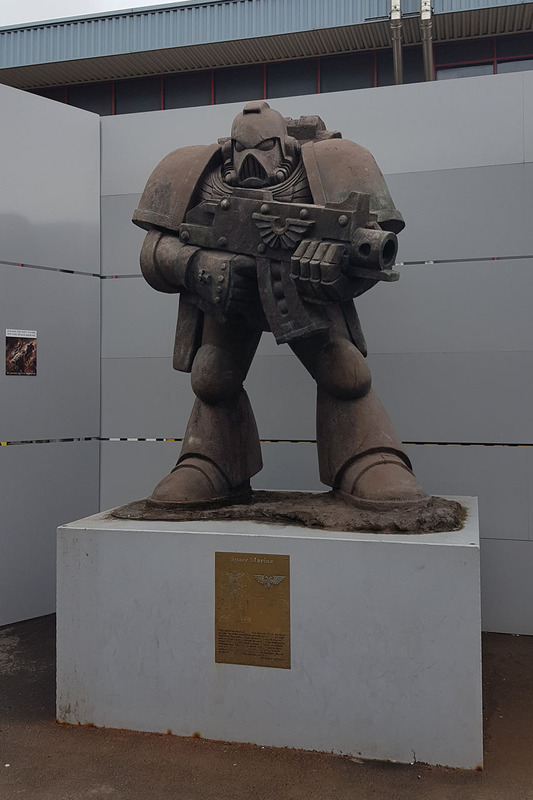 The old Space Marine can now be seen in the yard next to Bugmans Bar. 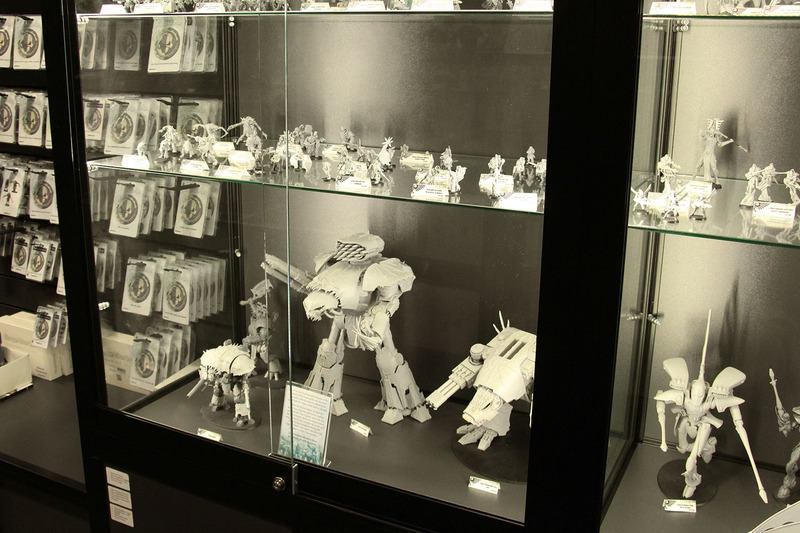 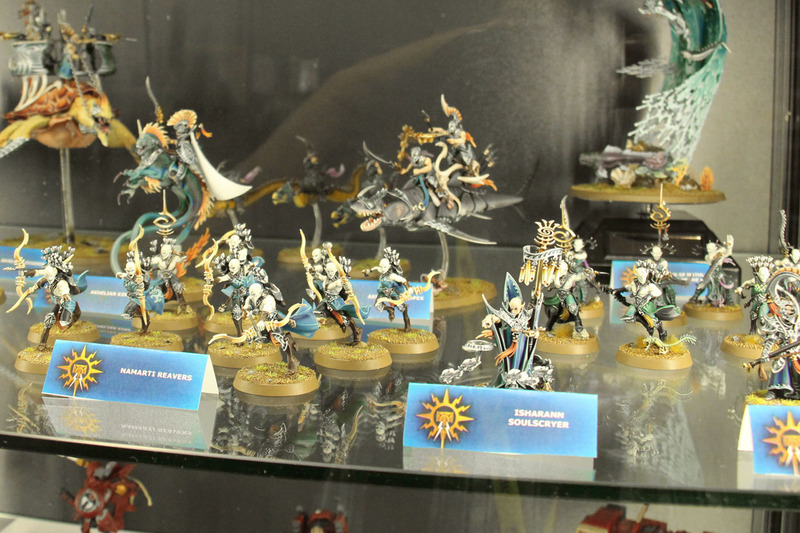 At the reception of Games Workshop office, there are rows of cabinets on both sides, covering their products along with third party products, that use the Games Workshop IP. 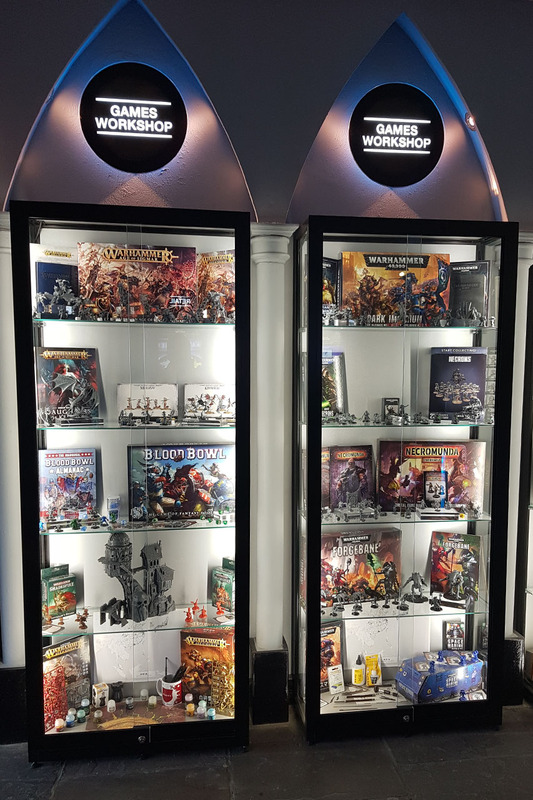 So you see some miniatures from Games Workshop and Forge World, books from Black Library, several video games and collectibles. 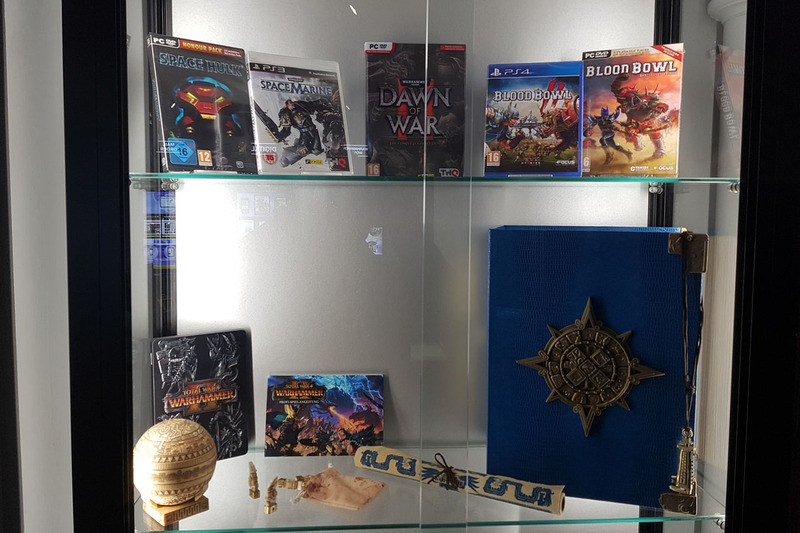 Even the Silver Play Button, for channels that surpass 100,000 subscribers, is shown. 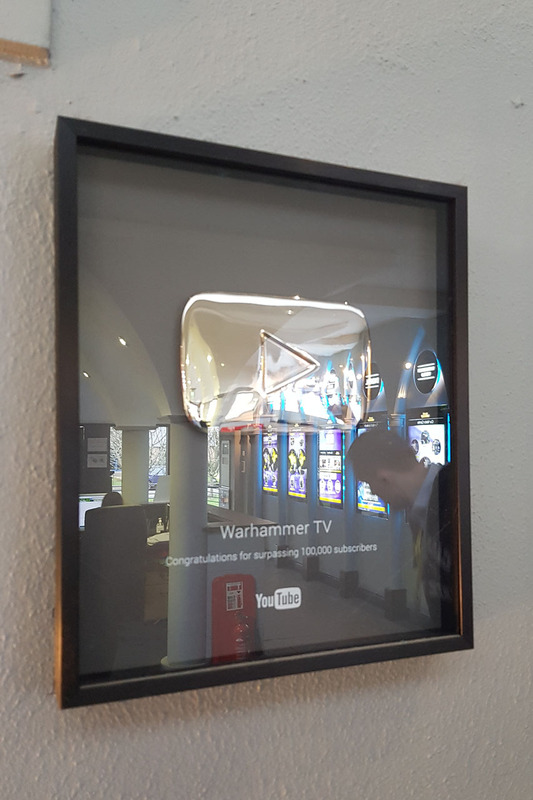 Games Workshop earned this for their WarhammerTv Youtube channel, making Duncan quite famous (he even became a Meme). 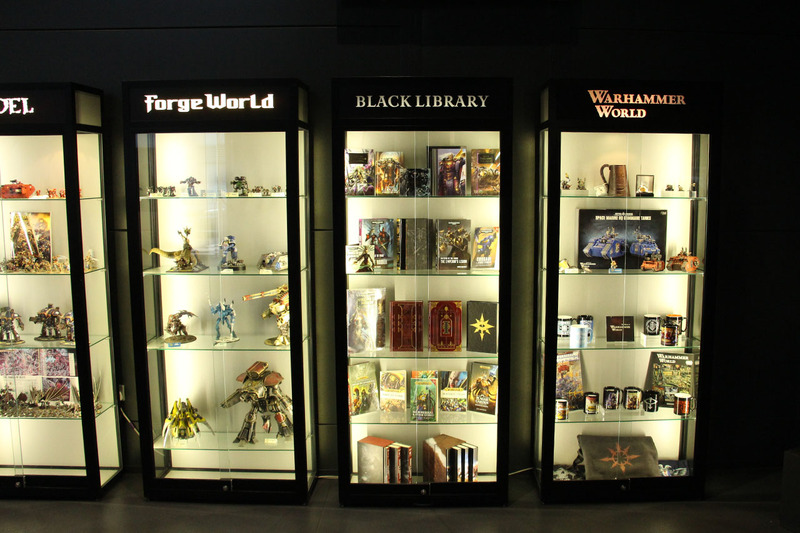 Warhammer World covers a round hobby experience, there is a gaming area, a Warhammer store, including a reading corner for Black Library, a Forge World store and a couple of cabinets showing the novelties. 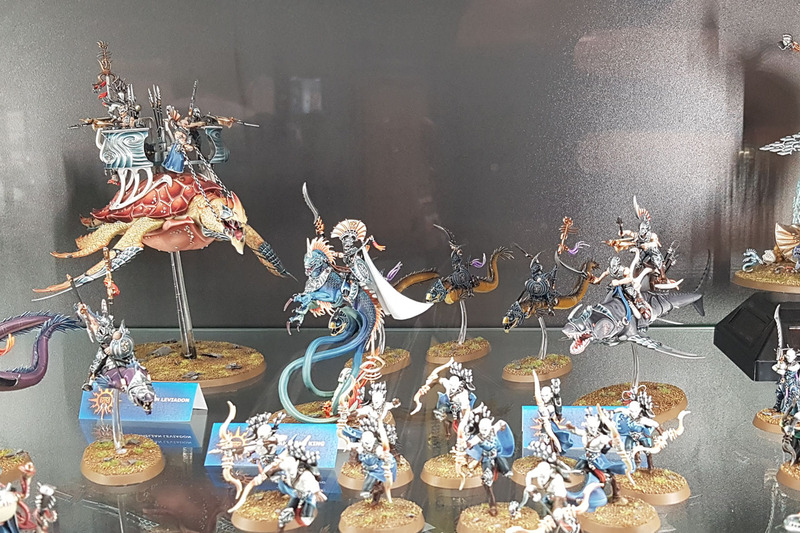 There is an enclosed exhibition centre, but I'll cover that with a seperate post, as I took more than 200 pictures just there. 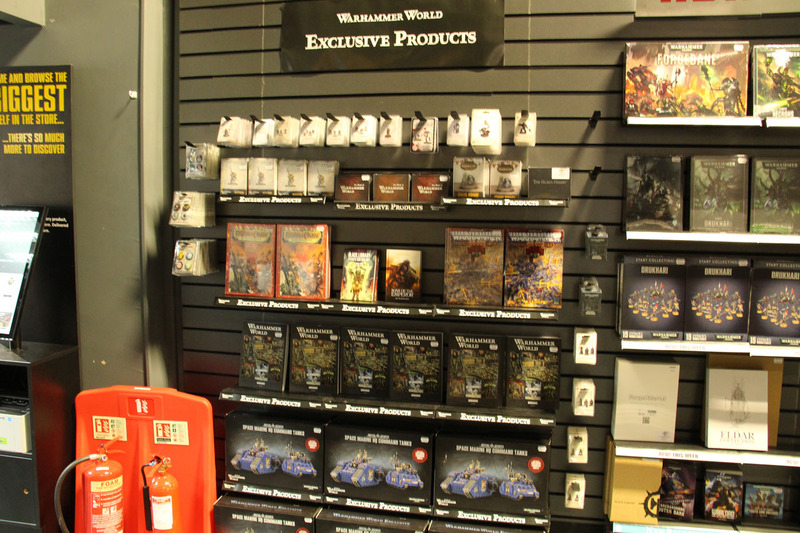 Here you see the Warhammer World store, with the Black Library corner, a few displays and the rack for the Warhammer World exclusive merchandise. 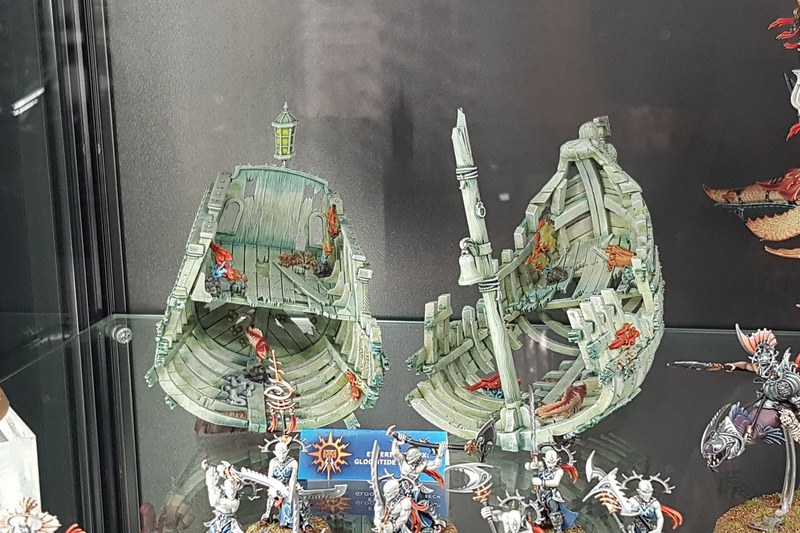 There are couple of things to know about the store, it is best to order a few items beforehand, to make sure that they are on stock, and they offer free shipping. 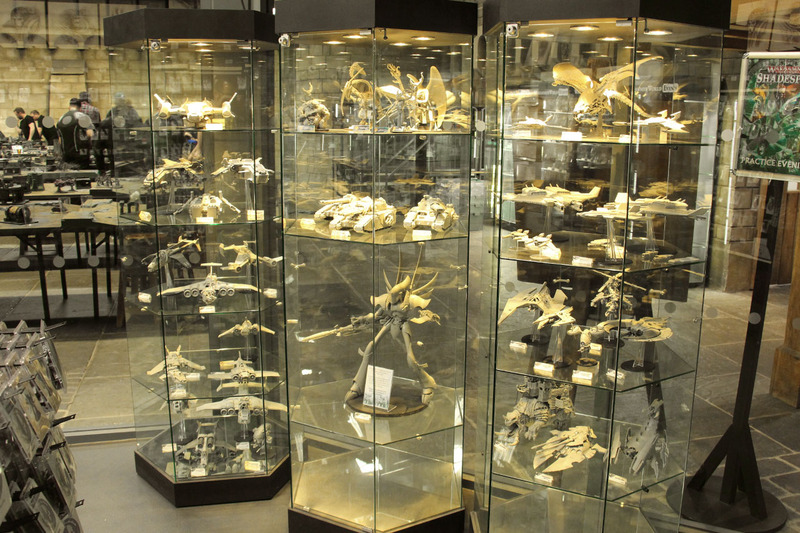 So you don't need to worry to fit your haul into your (hand) luggage, as you can have it send home. 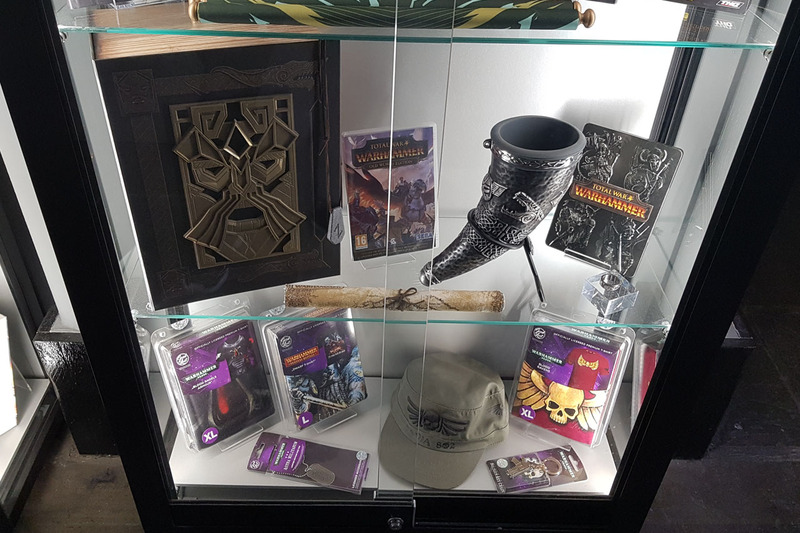 Just like I did with my couple of items. 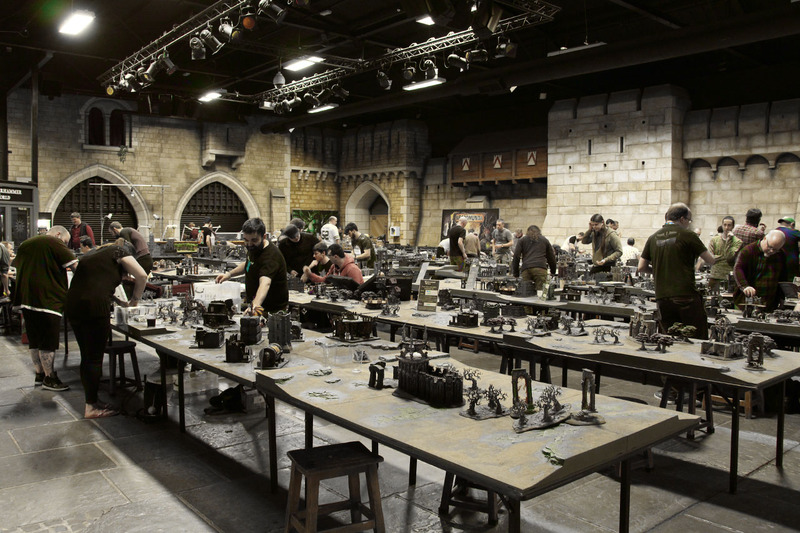 The gaming area has remained more or less the same for the last decade. 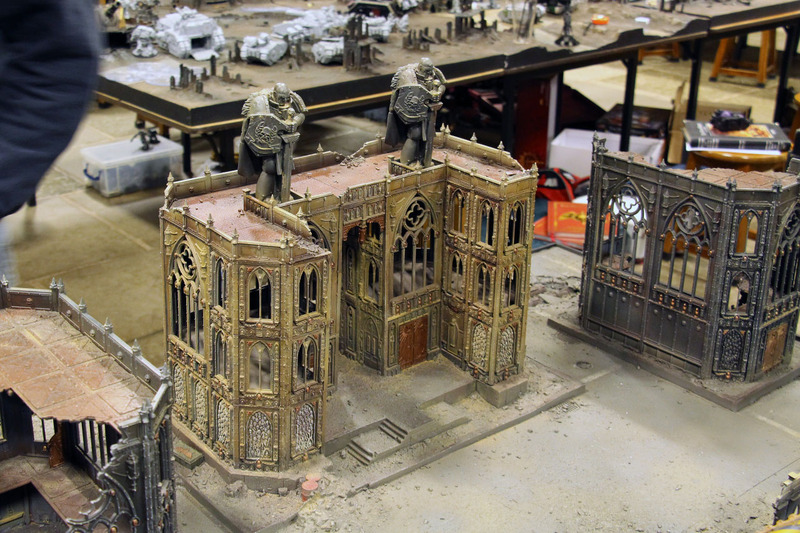 It is styled like the inner yard of a fortress, with elements from the Warhammer fortress and lots of easter eggs (some of the gargoyles have the faces of GW team members). 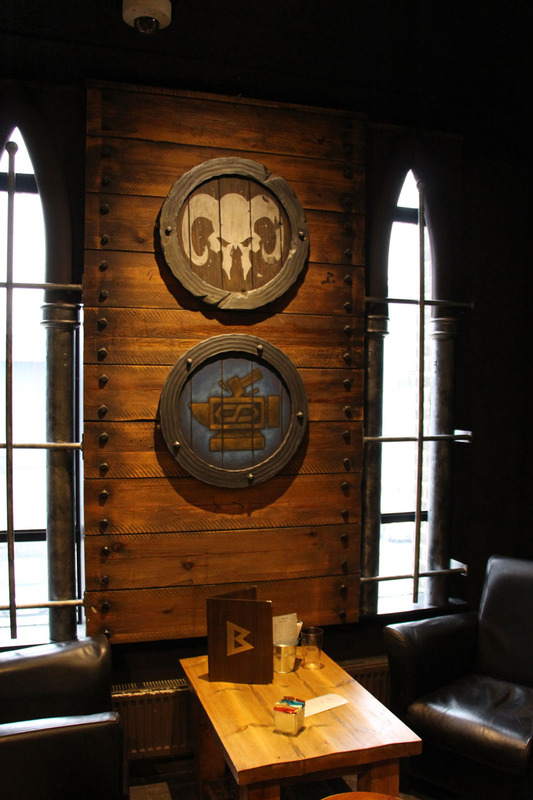 They added a corner, where they do the Twitch coverage and some of the event coordination. 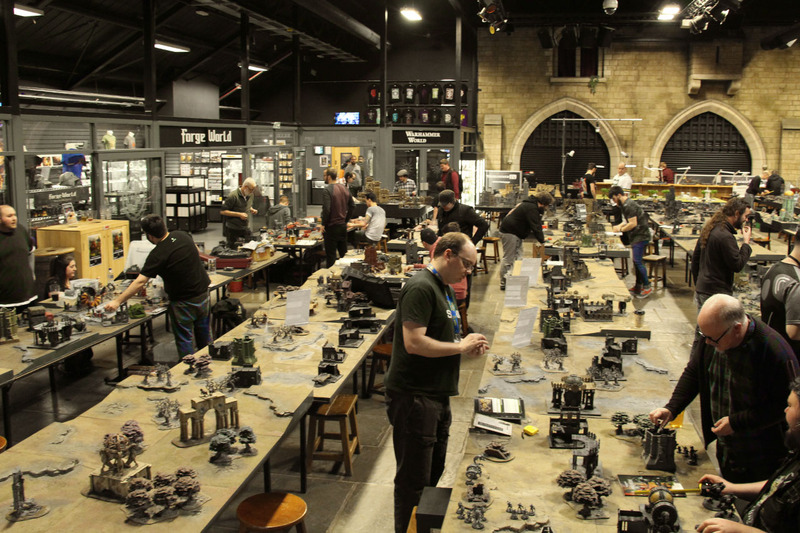 If I am not mistaken, they re-arranged the tables by 90° and shortened the hall a bit to make room for the Forge World store. 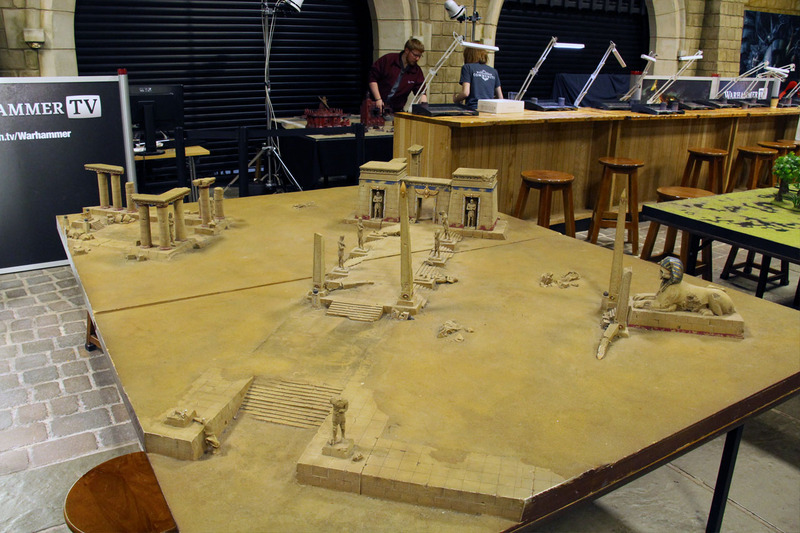 But the tables have improved by a lot over the time. 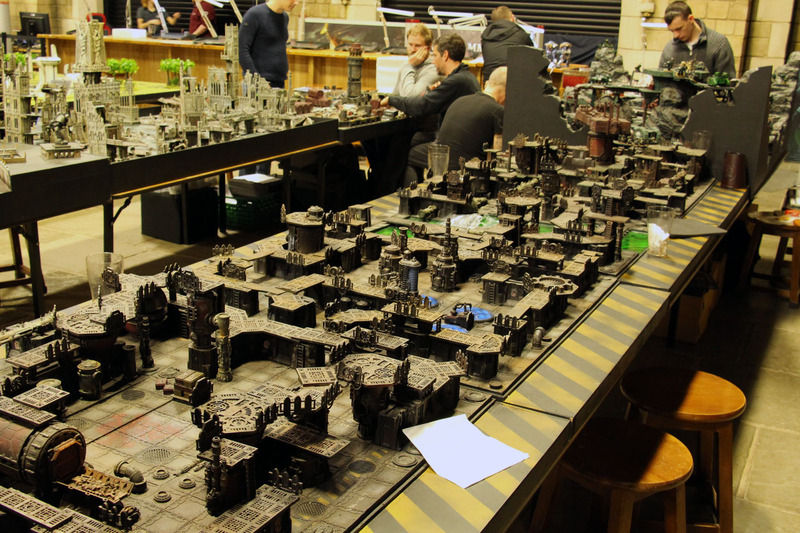 From the generic 4 by 6 ft tables, to a large assortment of the realm of battle boards, to an even bigger collection of custom tables, it is quite impressive to see. 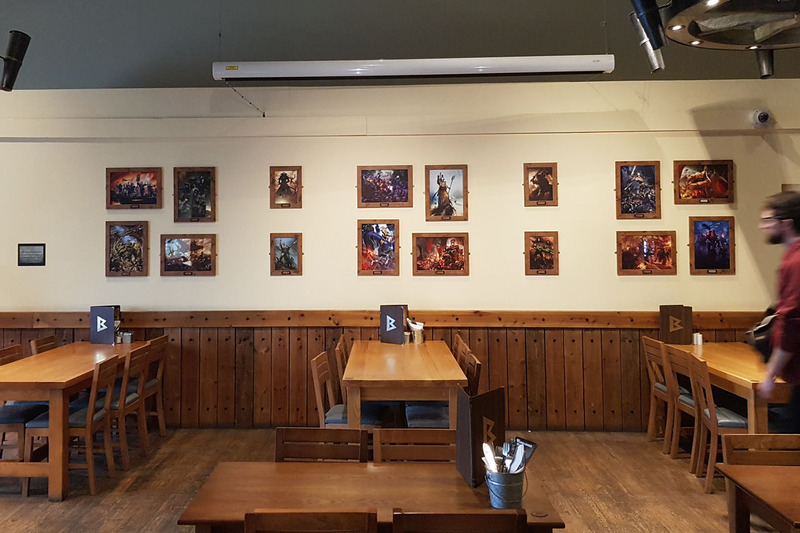 If you fancy a game, make sure to pre-book one table. 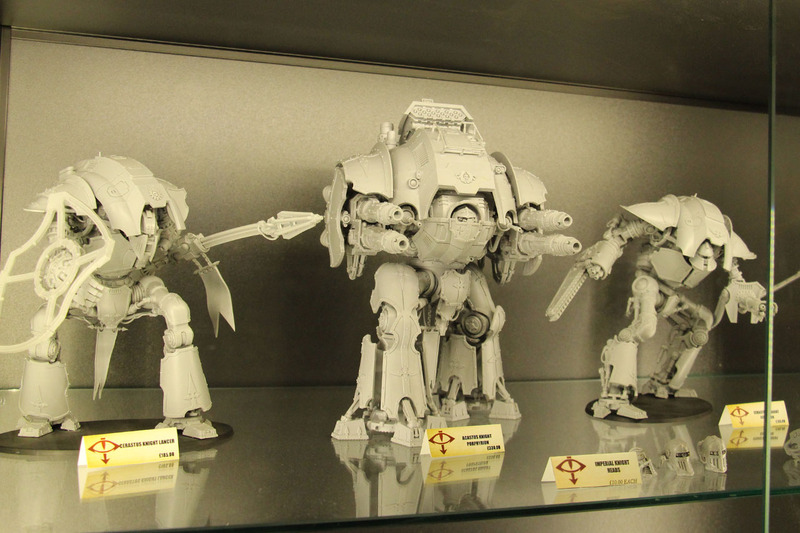 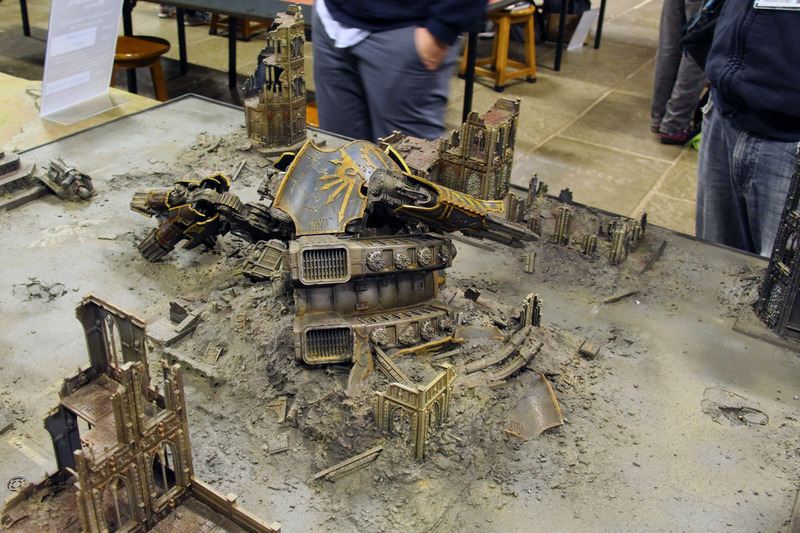 One of these custom tables, that I was really keen to see, was the one with the out-of-action Warlord Titan. 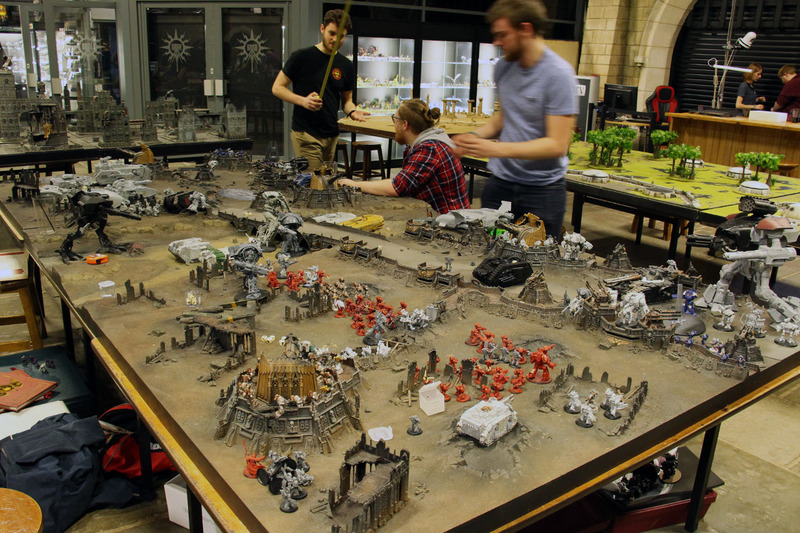 They started the table in january, with an update on february, covering their updates on their community page. 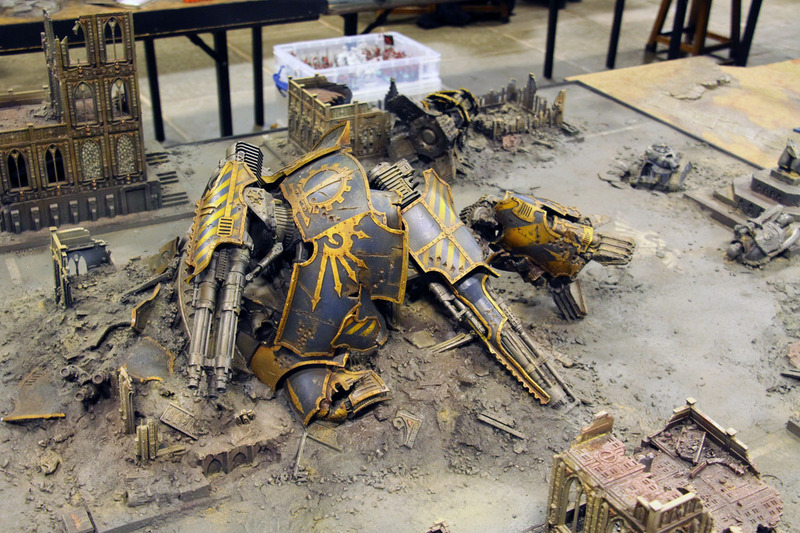 It is weird thing to see a kit that costs nearly 1,300 GBP scattered and destroyed as a terrain piece. 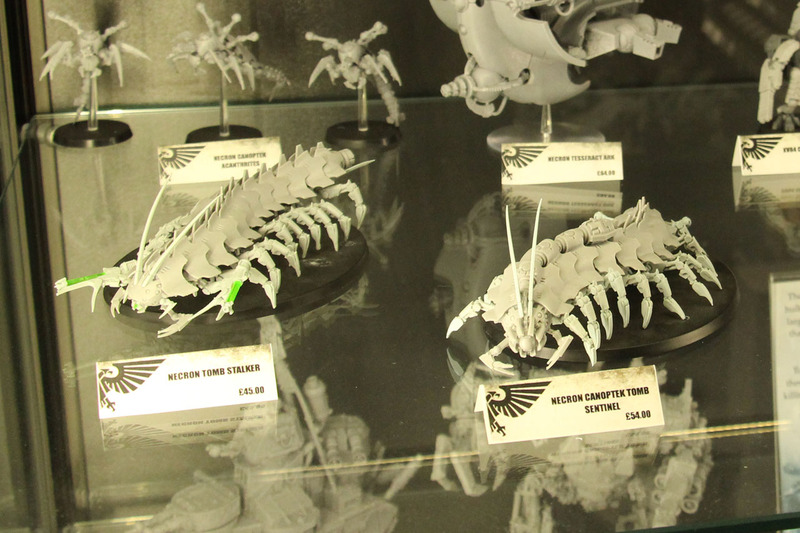 But they used miscasts and already damaged pieces from production for this. 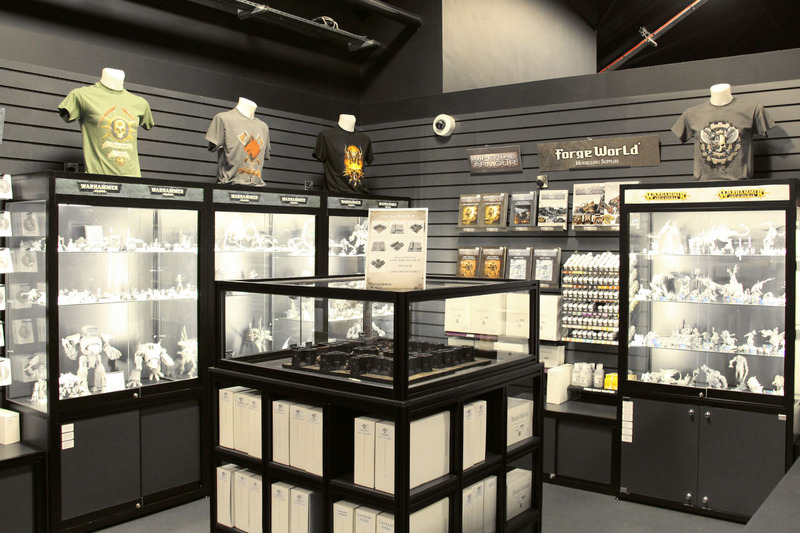 Along one sides of the gaming area, Forge World has their own store, all the resin goodies you could imagine. 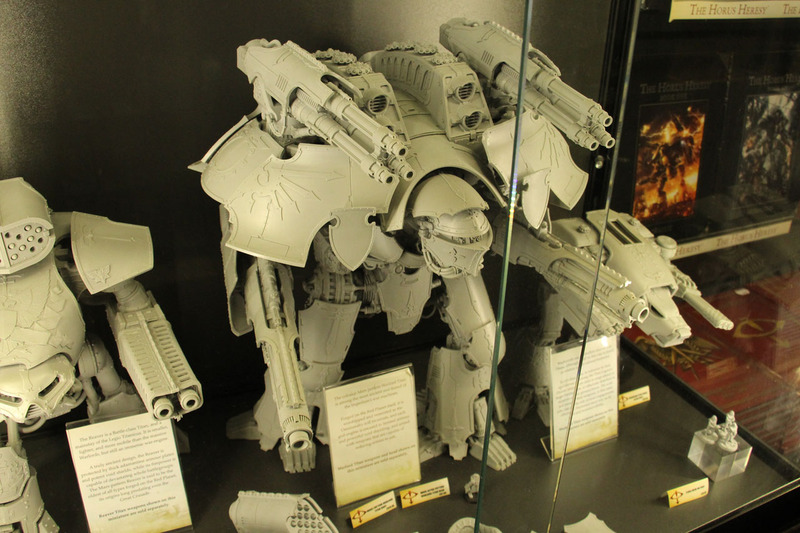 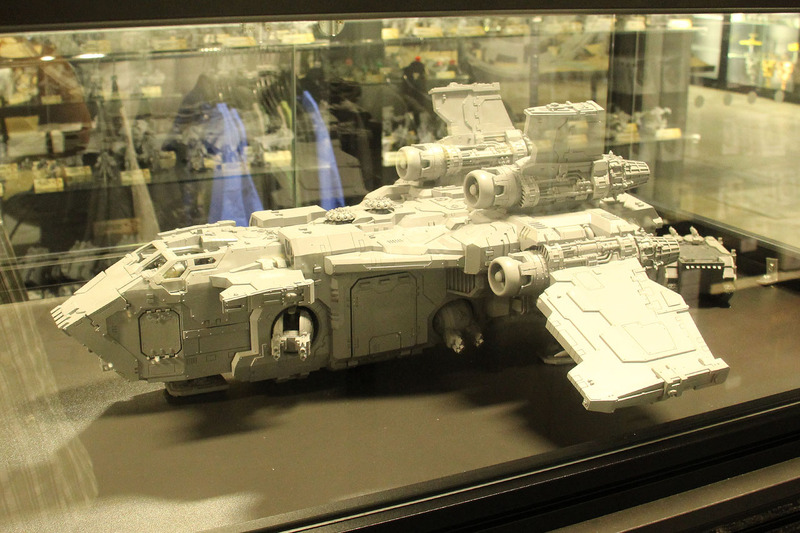 Most of the range is shown there in glass cabinets, including the huge show pieces, like the above mentioned Warlord Titan or a Thunderhawk. 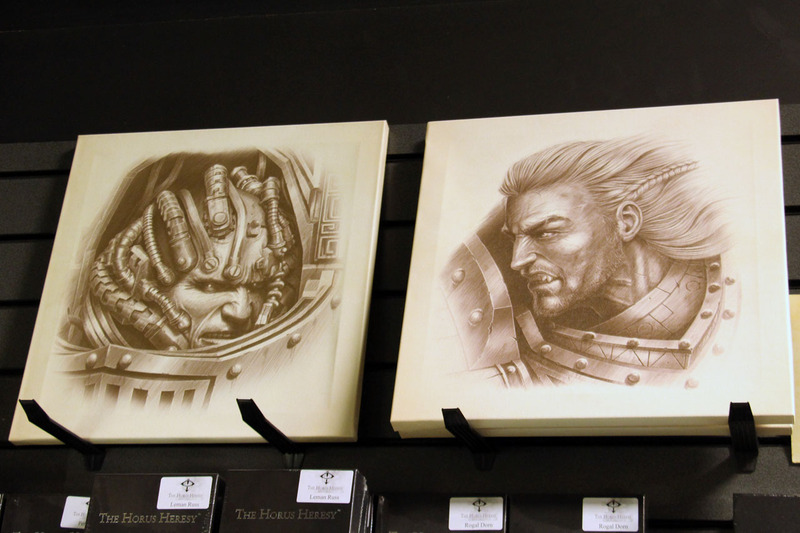 I like the Horus Heresy artwork, it seems as they helped themself liberally with actors faces (Arnold Schwarzenegger as Perturabo on the left and Al Pacino as Alpharius) for these. 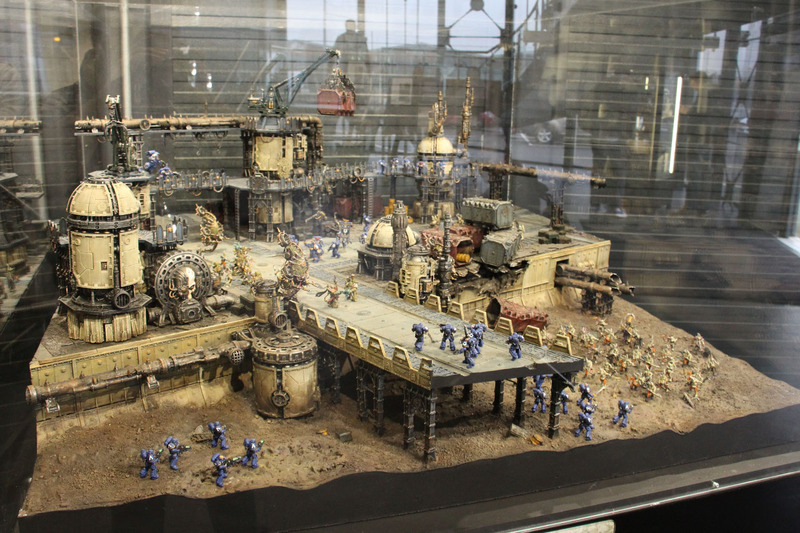 A center piece of Warhammer World is Bugmans Bar. 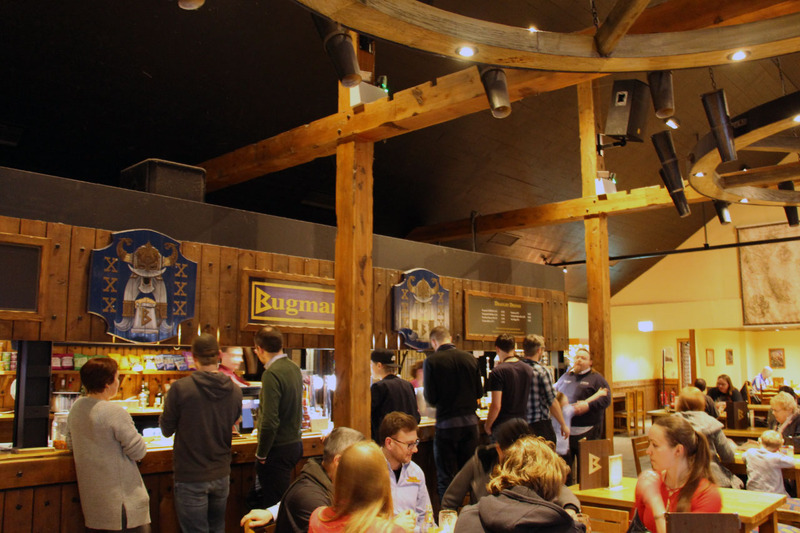 It is called after the greatest dwarfen brew-master, Josef Bugman, and offers a broad selection of drinks and meals. 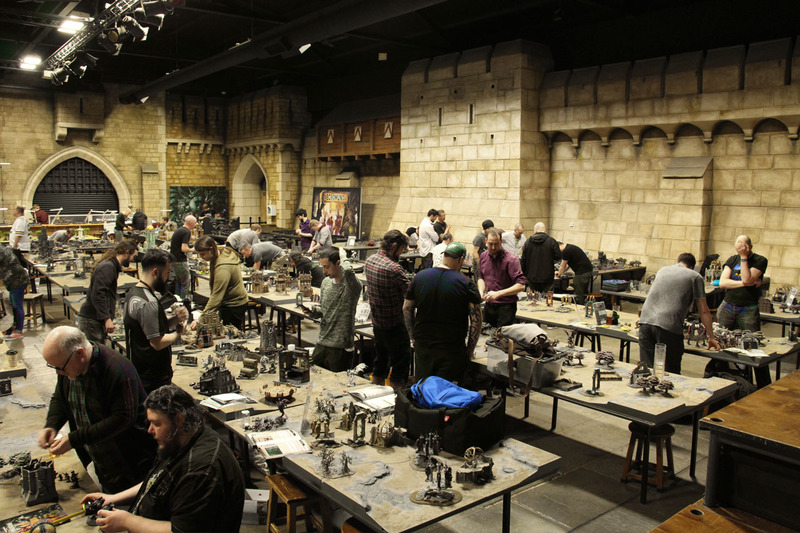 The meals are tasty and well made, the prices fair, in fact, it is used as a canteen by many of Games Workshops employees, even after their shift. 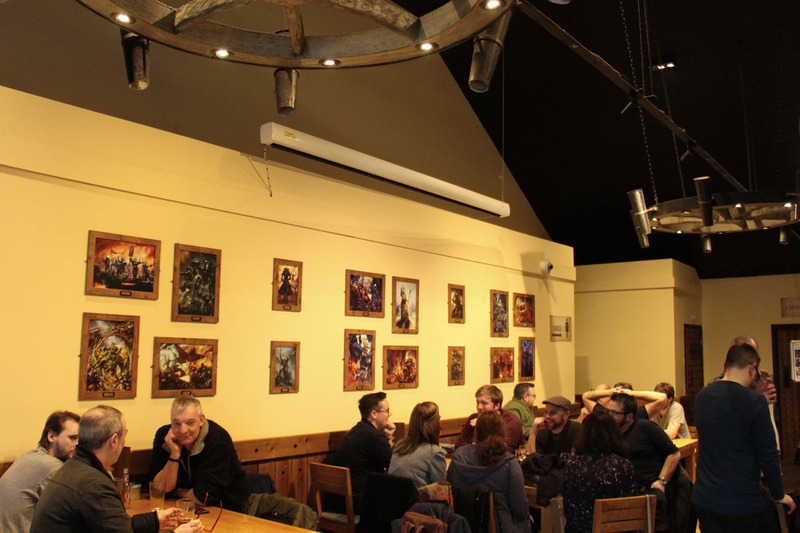 With free wi-fi, and snacks, coffee and beer, it invites you to stay and is a welcome place, for those who travel with you, who need a break or don't have anything to do with wargaming at all (spouses, significant others, parents etc.). 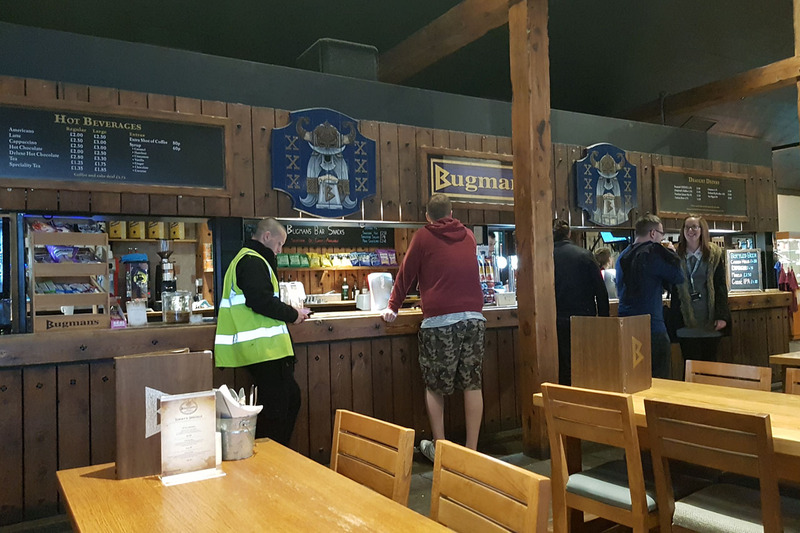 Fun fact, Bugman Bar offeres a couple of their own beers, that are actually specially brewed for Bugmans Bar and not just some regular lager re-branded. 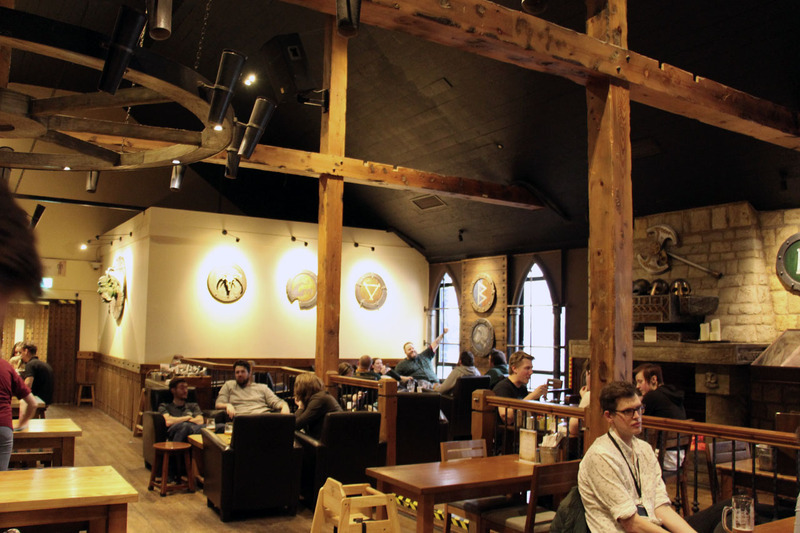 The different ales, stouts and such are even listed on Untappd, if you're going for those achievements. 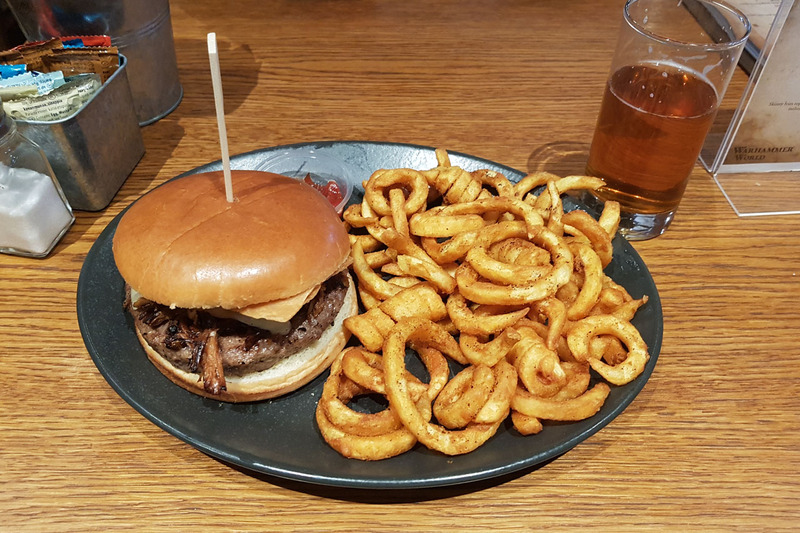 And let me tell you, those burgers are proper portions. 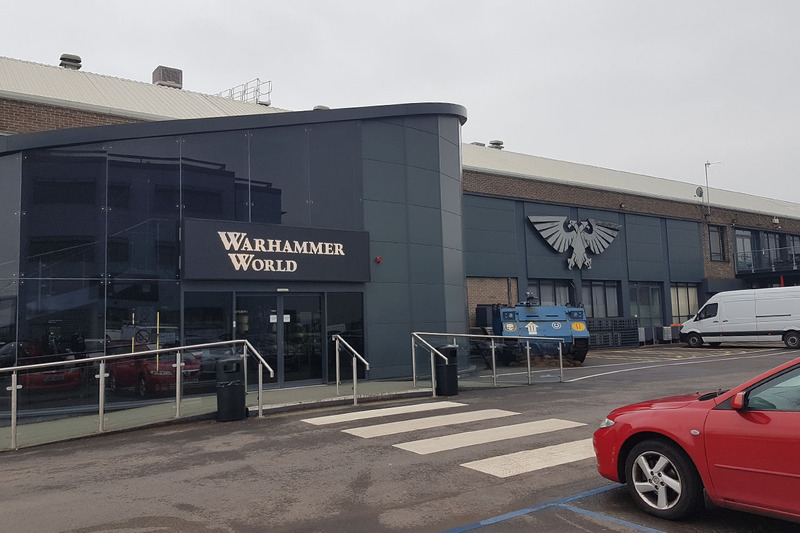 The exit / entry of Warhammer World is where they used to have the old store back in the day (very back in the day, that was the late 90s / early 00s). 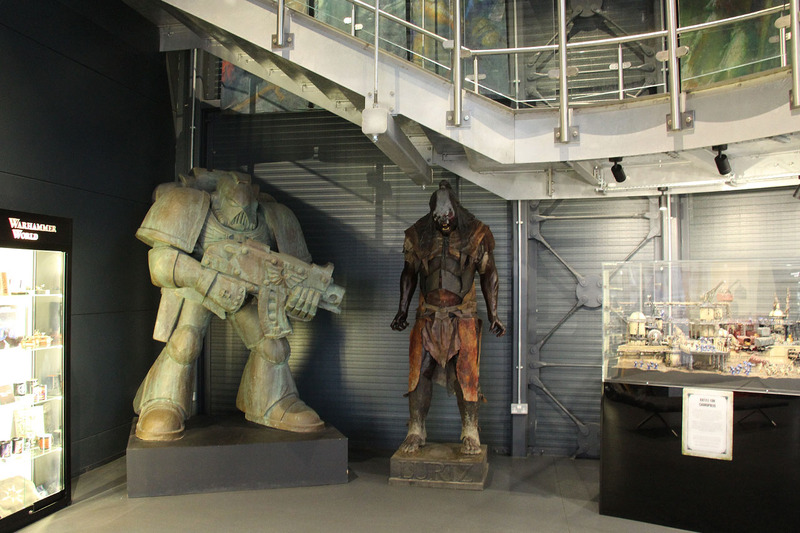 Now it is home to some of the pieces that used to be in the old exhibition / gallery, like the Space Marine statue or the Uruk Hai. 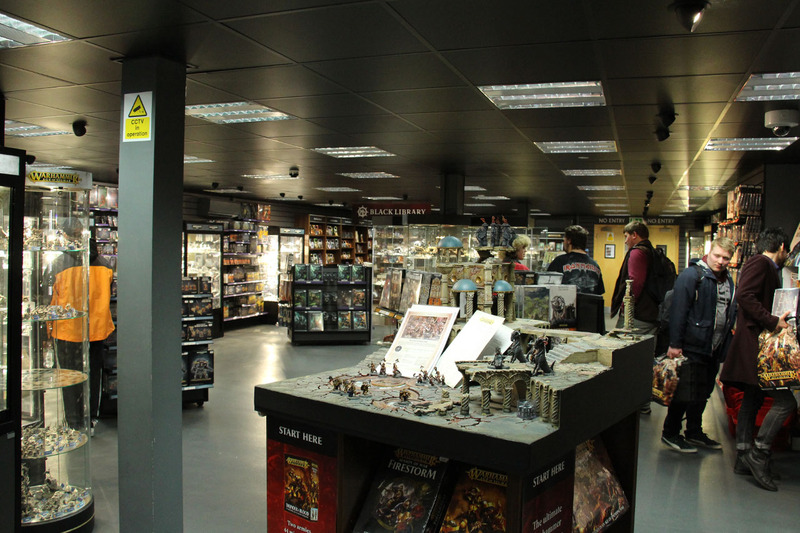 Of course, as this is the first thing to see when you enter it, it shows you lots of miniatures, two diorama tables and a vending machine for imperial coins (see my upcoming Salute haul article for those). 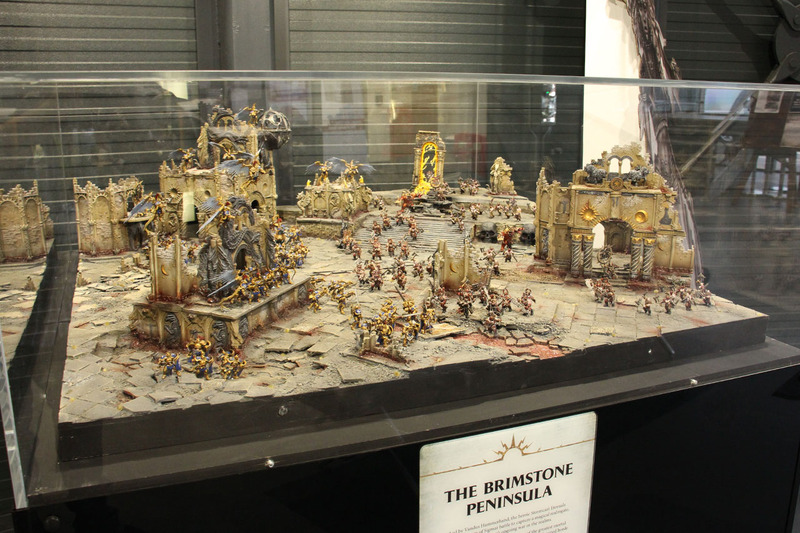 It had to be my 6th or 7th time to Warhammer World, to be honest, I don't really know how often I've already been there. 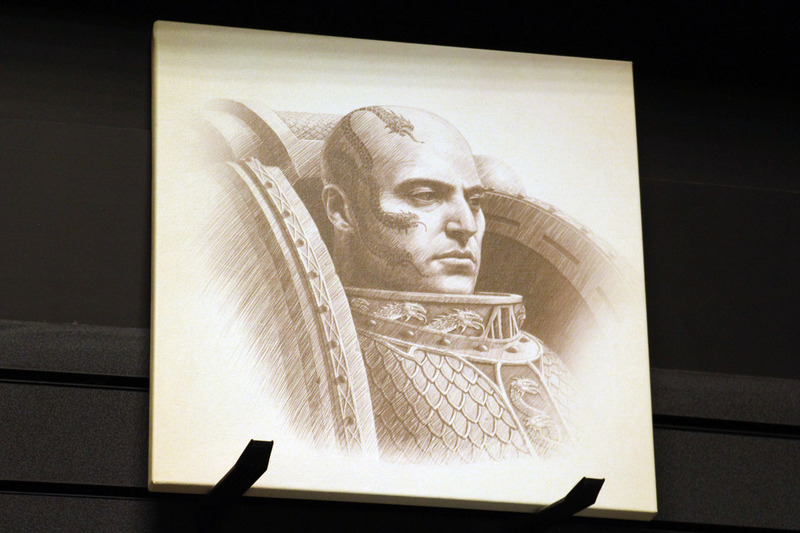 First time was in the late 90s around easter. 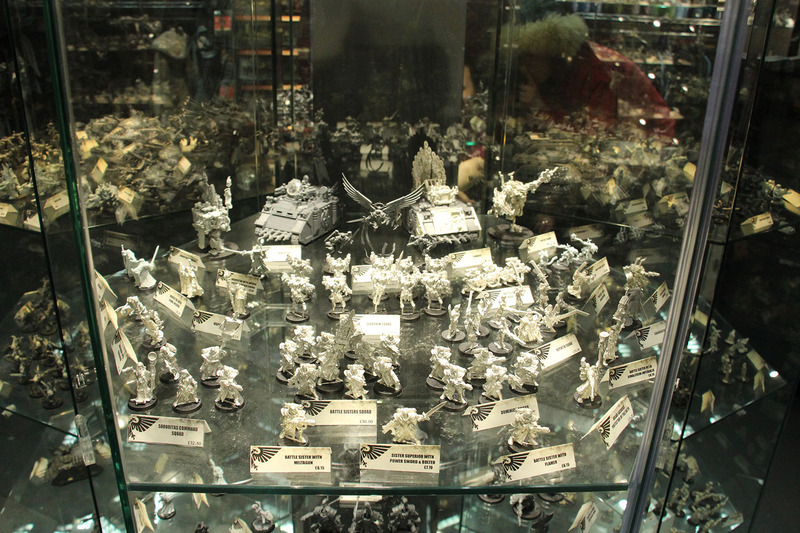 They had a store where the new entrance is, with a casting machine right in the store, so you could order miniatures and bits right there and they were casted for you. 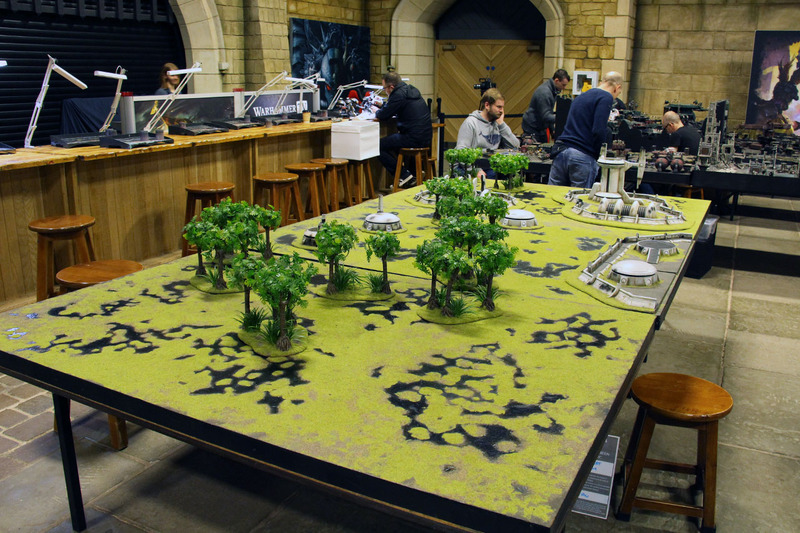 It was before the gaming area was build into the fortress courtyard and if I'm not mistaken before Bugmans Bar. 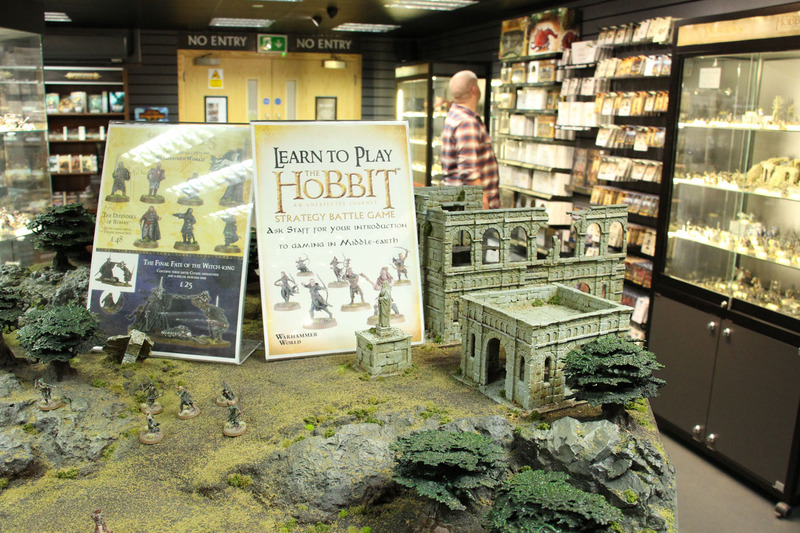 There was a exhibition, and it was a few pound per hobbyist (only gamers hat to pay, parents were free). 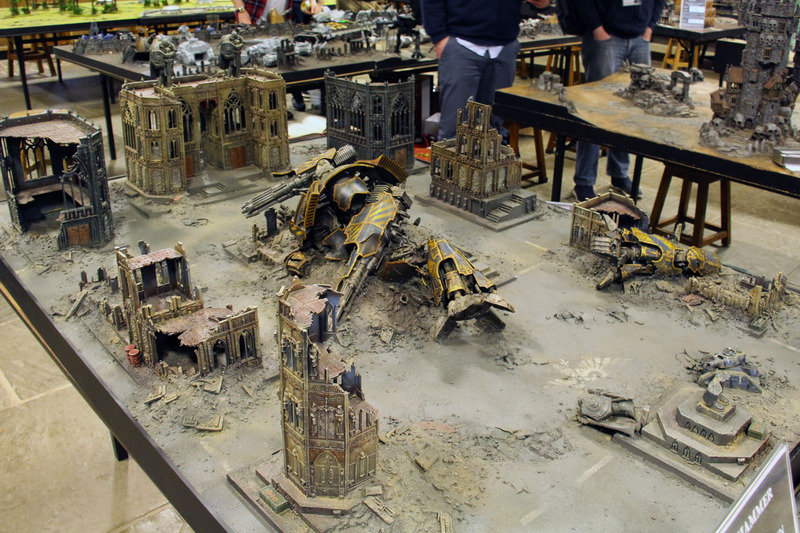 Lots of the Dioramas and big gaming tables were shown there, including a full sized Ultramarine battle company with the old metal Thunderhawk (they even let you hold it - it was heavy! 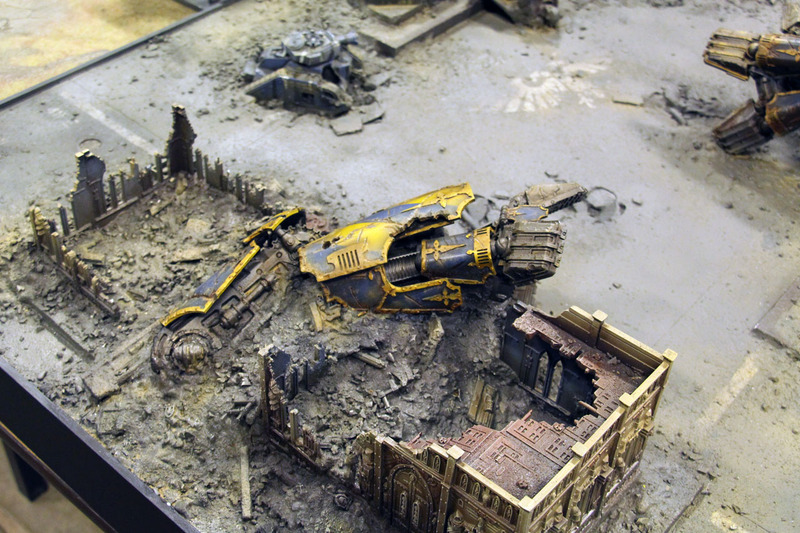 ), there was the Siege of the Imperial Palace on Terra, with a huge custom build Titan as a center piece, there was a battle between Orks and the Pratorian Guard, called Orks Drift, and the Breton castle besieged by the Lizardmen. 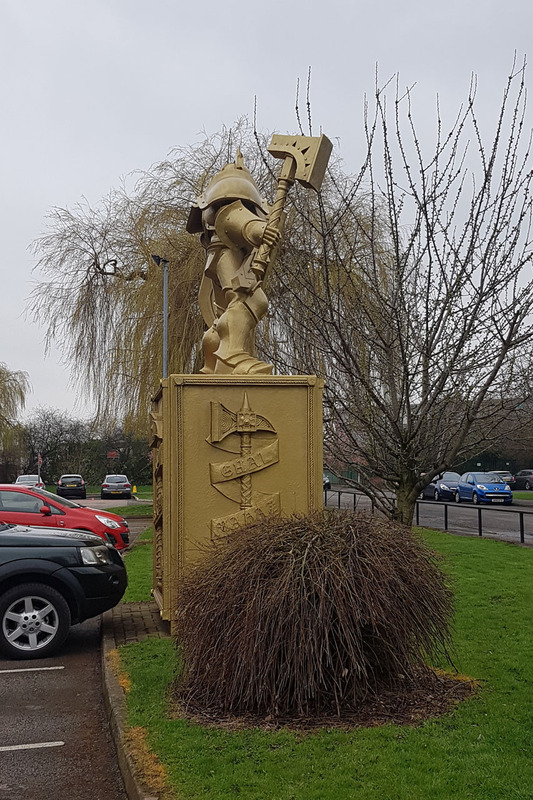 Since then I've been back a couple of times and it was interesting to see how it developed and grew over the last two decades. 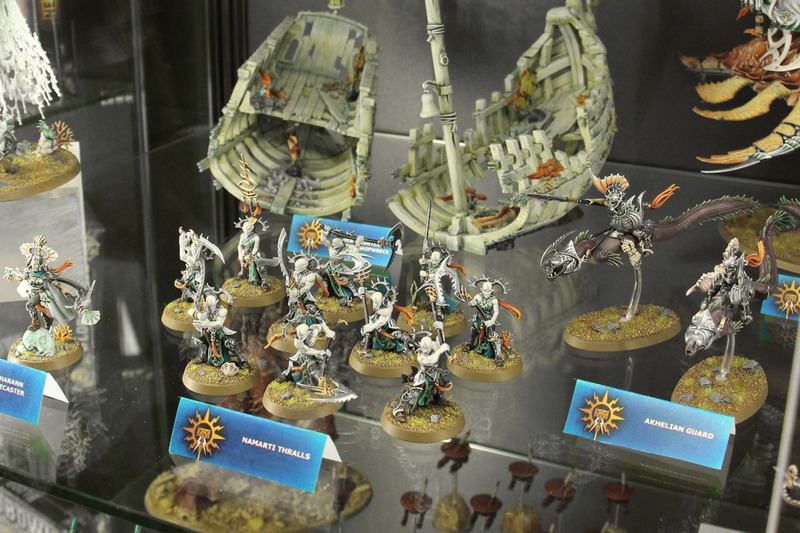 Everything you saw in this post is free to entry. 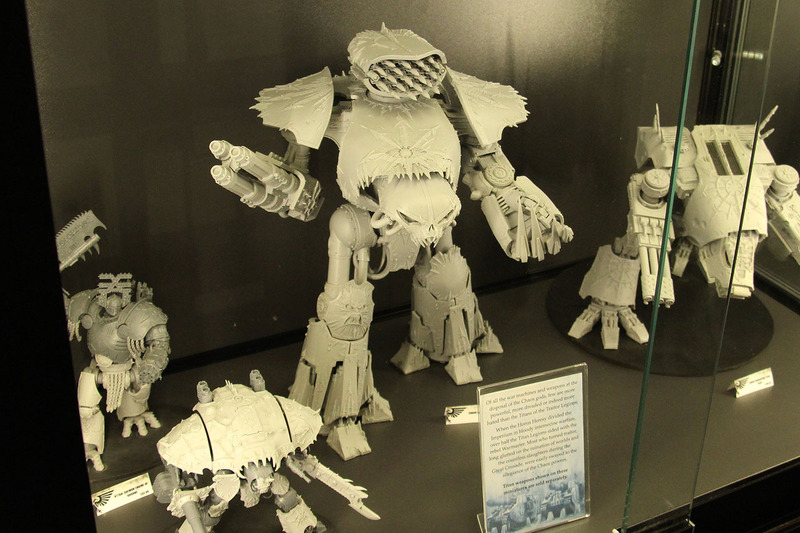 You only need a ticket for the exhibition, which will be covered in two separate articles. 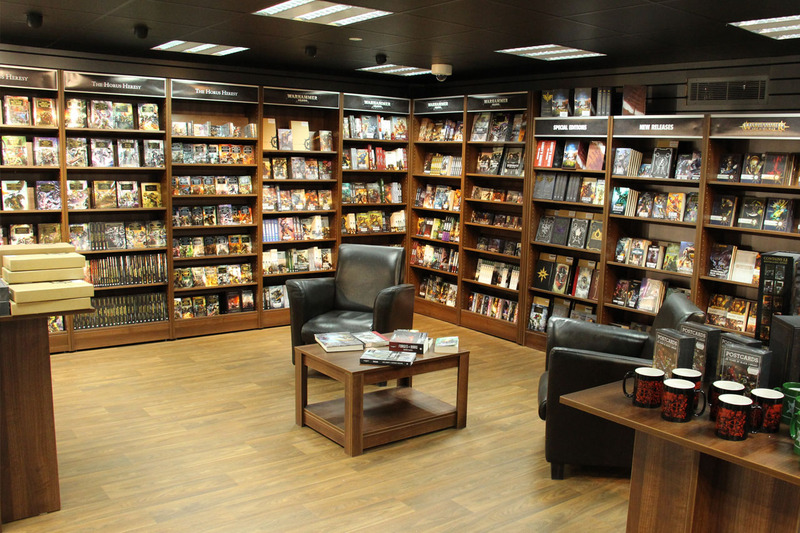 Regular tickets are 7,50 GBP, with reductions for children, disabled or groups. 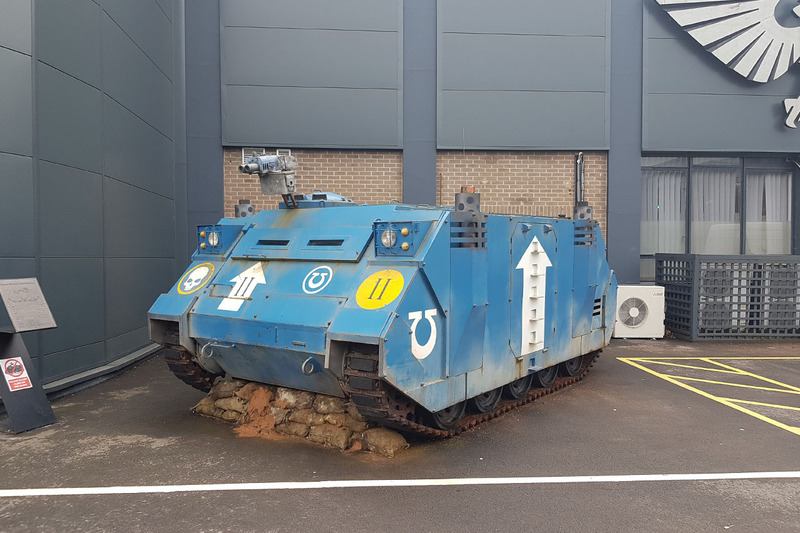 Warhammer World offers enough parking and is open during the whole week, with longer times in evening towards the weekend. 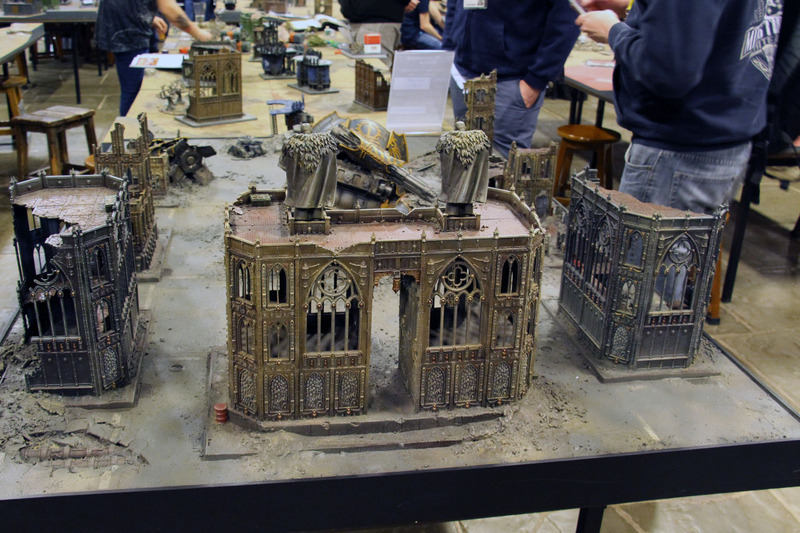 Just make sure to check on their event schedule, so your plans do not collide with tournaments or other special occassions, that may block parts of the venue.